Black and Tan Coonhounds are a hunting breed with a keen nose and an impressive howl, but they also make fantastic family companions. Black and Tans have exuberant puppy energy that lasts into adulthood—these comedians-in-fur will do anything for a laugh. Though they possess plenty of working-dog energy, they are laid back indoors. A Black and Tan is fairly likely to edge his way into your spot on the couch. That’s not the only thing they’ll steal, either. Countertops and trash bins must be dog-proofed if you share your home with a B&T—they’re notorious counter surfers who will eat anything they can reach. They can be stubborn, so training may be a challenge for a first-time or too-lenient dog owner, but with consistent positive reinforcement methods—and with plenty of high-impact treats—you’ll earn a friendly, affectionate companion. The Black and Tan Coonhound is also called Coonhound or Black and Tan, and occasionally B&T. Coat – Black and Tans have a thick, smooth, glossy coat in a rich black, with tan trim. The Black and Tan Coonhound got his start in 18th-century America as a raccoon and small game hunting companion. Older hunting breeds like the Bloodhound and Foxhound were used to develop the Black and Tan with the intention to create a hardworking dog with a cold nose and plenty of determination. George Washington was fond of dogs and kept many different breeds, including a variety of hounds; it is rumored four of them were Black and Tans with the convivial names Drunkard, Taster, Tippler, and Tipsy. The AKC recognized the Black and Tan Coonhound in 1945. Black and Tans have two modes: easygoing, ready-to-relax couch potato, and raring-to-go, on-the-scent hunting dog. They’re devoted to family and are kind and gentle with people of all ages. Puppy-like playfulness and goofy behaviors stick with the Black and Tan well into adulthood. They can be stubborn, and owners without hunting dog experience may be overwhelmed by the B&T’s tendency to take off after a scent, but with enough exercise and consistent training, they make mellow companions. Are Black and Tan Coonhounds Good with Kids? Small children may be overwhelmed by their large size and exuberance, but Black and Tans are gentle, affectionate dogs who do well with kids. While they’re patient and tolerant, however, no dog should be subjected to unnecessary poking, prodding, or teasing. Are Black and Tan Coonhounds Good with Other Pets? Black and Tan Coonhounds tend to get along well with other dogs and may be able to live with a dog-experienced cat. Their hunting instinct makes them unsuitable for small animals such as rats, hamsters, or rabbits. The ever-vigilant Black and Tan Coonhound is an alert watchdog who will let you know if anyone—human or animal—sets foot on his property. They're too friendly and gentle for guard dog duty. Puppy-like energy will last into adulthood, and they have a high level of energy while outdoors. With enough exercise and play, Black and Tans are calm, relaxed indoor companions who always finds the best napping spots. Black and Tan Coonhounds are known to howl and bay. If he catches a scent, a B&T is likely to follow it despite your recall. Tenacious B&Ts may be difficult to train. This is a working dog who needs a job to do. Indoor With enough exercise, Black and Tan Coonhounds are laid-back indoor companions. They're happy to rest at your feet—or in your lap—for as long as you'll let them. Because they are known for their mournful-sounding bay and need space to run, they're not ideal apartment dogs. Outdoor Black and Tans are rugged enough for the hunt and outdoor pursuits, and can tolerate a wide range of temperatures. They prefer to be near their people rather than outside in a kennel. While outside, they should be supervised and either leashed or kept in an area with a five-foot-high fence. Keeping them secure is important as their ears often shut off when their nose kicks in. If a Black and Tan catches a scent, he will follow it. Exercise Between half an hour to one hour of exercise per day will help keep the Black and Tan Coonhound well behaved and in good health. With enough exercise, they are often calm and relaxed indoors. Endurance Endurance was a top consideration in the development of the Black and Tan. They were made to travel rugged terrain and spend long days or nights on the hunt. Running Miles: Though a Black and Tan has the stamina to run up to five miles, his nose is likely to distract him from the task at hand. Short jogs and leisurely walks—with sniffing breaks—are more the B&T's pace. Hiking Miles: The Black and Tan Coonhound may enjoy long hikes, but he must be kept on leash to prevent wandering in search of wildlife. Food The general recommendation for how much high-quality dry dog food to feed a Black and Tan Coonhound is 3 to 5 cups per day, split between two or three meals. This amount is based on average weight and activity level. Because they are prone to bloat, the food bowl should be raised and activity limited for an hour following meals. While Black and Tans aren't more likely to guard their food than any other breed, children should never be allowed to touch or remove food from any dog while it is eating. Alone Time With enough exercise, a Black and Tan may be able to stay home alone for five to eight hours during the day, but this counter surfer may benefit from a crate to keep him safe—and out of your trash and snacks. Minimal effort is required to groom the Black and Tan Coonhound. Weekly brushing and baths as necessary will keep his coat in good condition. Expect some drool, especially in hot weather or right after a meal. Regular ear cleaning is necessary to prevent ear infections. Trimming nails regularly will help prevent painful splitting, cracking, or a broken nail. 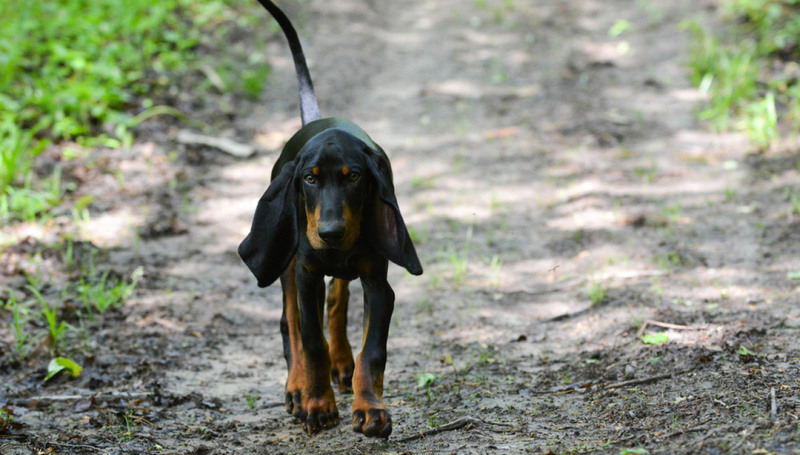 You can minimize serious health concerns in a Black and Tan Coonhound by purchasing him from a reputable breeder who engages in responsible breeding practices, and through screening for common diseases and conditions. Food-motivated Black and Tan Coonhounds will often perform basic obedience requests in exchange for treats. Coonhounds tend to be easily distracted, and—though smart—they aren't always willing to do as asked. Basic obedience, a solid recall, and leash manners are important first steps for the Black and Tan. Black and Tans are not common in the show ring, but they do make appearances. They also possess the intelligence and drive to compete in agility and other dog sports. Nosework and tracking are areas in which this scenthound is sure to shine, whether through scent games or in competition. Some Black and Tans have been trained for search and rescue, and they may have the skills and temperament to work as a service animal. Black and Tans were developed with the hunt in mind. They’ve got a ‘cold’ nose and can follow days-old scents with ease. If you’re looking for a sporting dog who will tree raccoons and other small game, as well as take on bear, deer, and other quarry, the B&T might be a good choice. The Black and Tan can also put his skills to use in trials rather than the field. Nosework, tracking, and lure coursing may satisfy the B&T's hunting drive. What does a 'cold nose' mean? Scent hounds like the Black and Tan Coonhound are referred to as dogs with a 'cold nose.' This means the dog is able to follow scents that are hours or days old—called cold trails. Why do Coonhounds have long ears? The droopy ears sported by the Coonhound—and many other scent hounds—are important for the dog's scent tracking ability. Because they're so low-set, the ears drag on the ground when the dog is following a scent. Those long, dragging ears direct the scent they're following right into the nostrils, amplifying it. The dewlaps and hanging skin also play a part—those wrinkles and folds trap the scent the dog is following for an easy memory refresh.